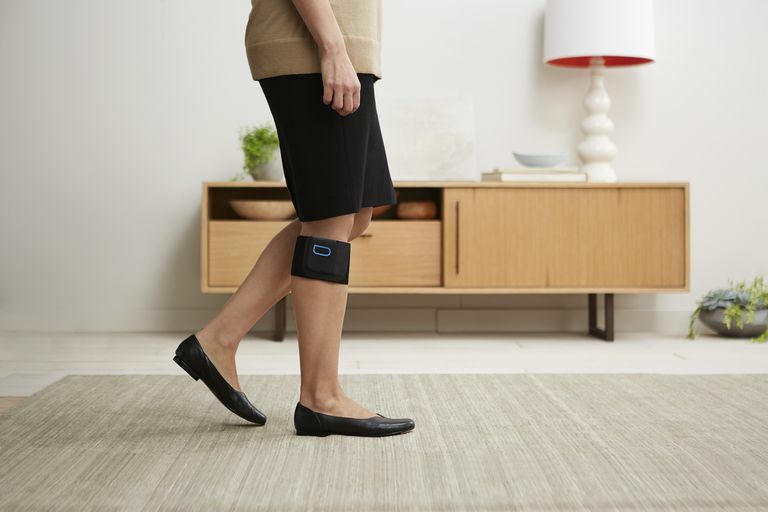 The Quell is a wearable device aimed to ease chronic pain from conditions like fibromyalgia, diabetic neuropathy, sciatica, and osteoarthritis. It's a small, square device that sits in a velcro pocket with an electrode snapped inside. Like a TENS unit, the electrode strip sends electrical signals that trigger your body's own pain relief mechanisms. The Quell is an FDA-approved Class II medical device for symptomatic relief and management of chronic pain. It is available without a prescription. You slip the Quell into the breathable sports band and wrap it around your upper calf. Then you calibrate the system so that it gives you as much stimulation as your body needs. You control how much stimulation is given to your body, then the Quell takes over. It automatically works for an hour and then shuts off for an hour, continuing that cycle for as long as you wear it. It's designed to be worn 24 hours a day so it even senses when you're sleeping and changes the stimulation. It easily fits under your clothes and it also works with a free app to track your therapy and sleep history. Quell stimulates peripheral sensory nerves with a measure of electricity. These peripheral sensory nerves carry neural pulses to the pain center in your central nervous system. This causes your body's natural pain-relieving opioids to be released, which stops the pain signal from spreading. These natural opioids often work better than prescription meds. It works. In a study published in the Journal of Pain Research, 80 percent of participants responded to the Quell reporting that their chronic pain had improved in 60 days. It's comfortable. As small as it is, you will feel it the first time you try it. It may feel a little weird to walk around with it on and it takes some time to get used to, but it's very lightweight and if you use it regularly, you barely notice it. It's easy to calibrate. The idea is that a pulse is sent through the Quell, kind of like a very mild electric shock. It continues pulsing for an hour and you are in charge of the settings. Once you calibrate it, you can still change the settings if it feels like it's too much or not enough. It's easy to use. Unlike TENS units, where you have to place the leads and wires, the Quell has one giant electrode that wraps around your calf in one easy movement. It works automatically. Once you turn it on, it continues working the way it's supposed to, so you don't have to think about it. A variety of options. There are different electrodes to choose from, regular ones you can wear daily and sports electrodes which have a different type of gel designed to work better when you're sweating. You can also choose bands in a variety of colors. It may not work for everyone. As suggested in the study, not everyone responded to the Quell, so that may the case for some. Quell offers a 60-day money back guarantee so you have nothing to lose in trying it. It's pricey. You can find small portable TENS units for under $20 in some places, so the Quell may seem expensive at over $200. You also have to change the electrodes every few weeks, so that's an extra cost. They do send you extras when you order the product. The Quell has great potential for people dealing with chronic pain. The company says they aim their product towards people who have sciatica pain, fibromyalgia, diabetic neuropathy, and osteoarthritis. If you are looking for a way to get pain relief without drugs, you may want to try the Quell. Gozani SN. Fixed-site high-frequency transcutaneous electrical nerve stimulation for treatment of chronic low back and lower extremity pain. Journal of Pain Research. 2016;9:468-479. doi:10.2147/JPR.S111035. Will the Film 'The Way' Inspire You?